I got a pressure sensitive graphics tablet for xmas, but I wasn't very impressed with it, it had two major glitches which rendered large portions of the tablet unusable. 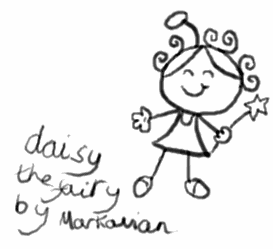 The best drawing I did, was Daisy, the Fairy... half copied off a christmas card. Its okay, its kinda fun drawing using a tablet, but I couldn't reproduce the fine curves that you can get by using a pencil (infact, it wasn't even close). I'll just stick to paper for the moment! Daisy will be my reminder.